What are successful ecommerce websites made of? They did not succeed out of nowhere. They most likely implemented an effective marketing strategy. One of the marketing strategies that have worked for several ecommerce programs in the past is referral marketing. Today, you’ll learn all about what it is and how you can use it to boost your ecommerce business. Step 1 is all about familiarizing yourself with referral programs. It includes knowing what a referral program is, why you should use it in your ecommerce website and knowing what it looks like. So this step is all about exploration. This will help you get to know what you are getting into. In simple terms, a referral program is a system where you allow your website visitors to refer other people into your website. When they do this, you reward them in return. So it acts like an agreement. You promise to reward them with something if they promote your website to other people. On the surface, it may seem like a simple agreement. For example, almost anyone knows at least 5 people in their life. If you will create a referral program based on this you can ask “If you can introduce my business to at least 5 people in your circle, I’ll give you a reward.” It is that simple. You give something in exchange for other people’s promotion of your business. From here, you are probably wondering if a referral program is worth your time. Well, let me tell you that most of the successful ecommerce businesses online started from referral marketing. It can be as simple as rewarding people with a coupon for signing up or giving them something when their ‘friend’ buys. These are all forms of referral marketing. You need to do referral marketing in your website for one reason: it helps drive more people into your website. Think about it. When 1 person refers 1 other person, that other person can also refer another… and another… and another. And the cycle continues. It is only in referral marketing can you have access to such a powerful marketing opportunity. Now that you know what a referral program is, let’s start exploring some of them. This will give you a better idea on what a referral program is as well as help you in creating your own referral program. 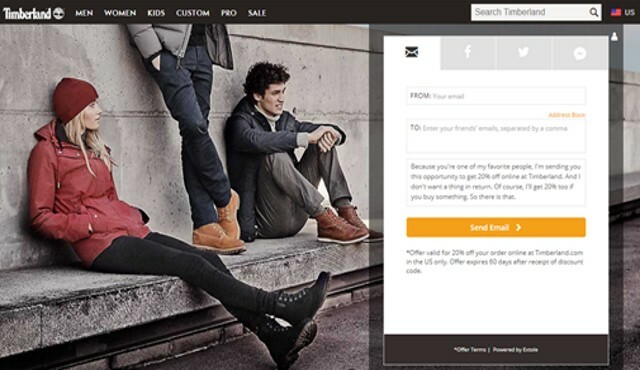 The first example I have found is the refer-a-friend program of Timberland – a well-known brand for apparel. They allow referrals in 4 different platforms: email, Facebook share, Twitter and Facebook messenger. This allows them to get referrals not only through email but in other platforms as well. Next is Missguided. 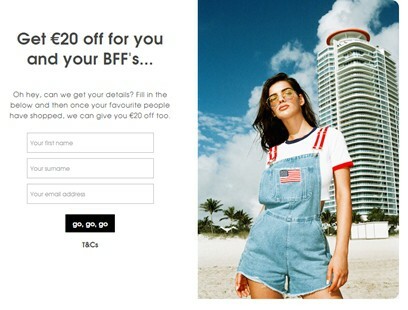 This is also an apparel shop that gives away 20 Euros to all referrers and referrals. Referring is as easy as keying in the name of someone you know along with their email. And then, there is Regions. This is different from an ecommerce store but they give a rather interesting reward. 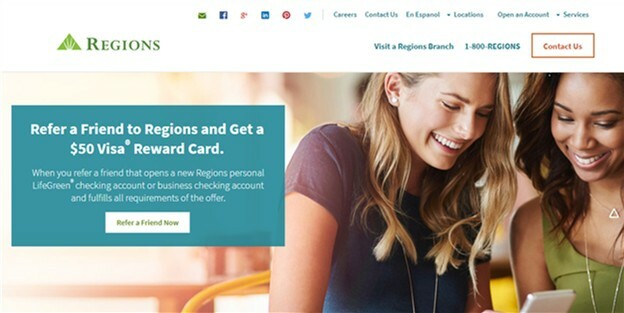 They give away a $50 Visa rewards care for every referrer. That is quite high. Now you can use these referral programs in crafting your own. You can use their format as your inspiration to create a referral program that is most suited to your business. You may have notice that all of the referral program in step 1 has one thing in common. That’s the reward. Frankly, you cannot expect to have a referral program without a reward. As stated in the definition of a referral program, you need to give something in return for your customer’s promotion of your business. So a reward is important. However, you just cannot plaster a reward into your program just because you have seen it in another program. It is very important to choose the type of reward that will best suit your target market. In this section, you’ll learn about the three different types of rewards that you can use in your referral program. This is perhaps the most common out of the different types of rewards. At least, this is true for ecommerce websites. Why is it so common? It is because it is so easy to implement. Simply name your discount code and encode it into your ecommerce system. Then you can instantly start your referral program. No need to give away anything else. What’s the most common prize in contests? It’s cash of course! Cash is popular because almost everyone can use it. This means that it doesn’t matter if the person is interested in your website or not. As long as you implement a cash-based reward program, you’ll attract these people. Even if they may not be interested to purchase from you, you can still ‘pay’ them to refer people to you. However, it is important to note that cash discounts is different from cash. Cash discounts is quite similar to the discount code in the sense that you don’t give away anything. Instead, you deduct a specific amount in the prices of your products when someone uses their cash discount. This is effective if the prospect is interested in buying from you to begin with. Freebies have a rule. They must be highly relevant to your market. Else, no one will sign up because of it. So if you are running an ecommerce store on makeup, giving away a lipgloss is a good idea. But it may not be a good idea to give away a shirt for your prospects may not be interested in it. However, freebies can be crazy powerful when it comes to persuading people to refer people to your site. In fact, it is even more powerful with a limit. So if you only have 100 lip glosses, you can say that you’ll give them away to the first 100 referrers. You’ll instantly see referrals right away and it may even be more than 100. The key is two things: choose a highly relevant freebie and limit its count. That’s all there is to it. Next, you should choose who to reward. You may have seen the message ‘Give $X, Get $X” earlier. This signifies that there are two parties getting rewarded: the referrer and the referral. Now you can choose to reward one or reward both. Who you reward will have its pros and cons and you should be ready to deal with them. If you choose to reward the referrer, you’ll encourage him to refer more people to your store. However, the person signing up for him may not be as motivated. After all, he will not get anything for signing up. On the other hand, rewarding the referral can also dilute the encouragement of the referrer to share your program. While the referral may feel happy, the referrer will not be as motivated. Whereas if you will reward both, it can be quite costly. Think about it. Not only will you have to reward the referrer, you’ll also have to reward the referral. And this is for every successful referral. So if you get hundreds of thousands of referral, this can drastically affect your bottom line. So what will you choose? Now that you know the pros and cons of each, it is up to you on which path you’ll take. By this step, you should have already decided on your reward and have chosen who you will reward. After all, all that’s left is to set up the actual program. For that, you’ll need to finalize your program content. To do this, simply state the reward and who will be rewarded in a short paragraph. Then, implement a time limit. This will allow you to switch rewards and make the program appeal to the fear of losing out. And then, get the program ready for launching. For that you’ll need a referral software. A referral software helps you setup your referral program by giving you all the functionalities that you need. In its most basic version, it should include a referral sign up page, a thank you page, an admin dashboard and an affiliate dashboard. The sign-up page is where visitors can refer the website to other people. It includes a form that captures emails and other details. Then, a thank you page should contain a link to a reward or a way for claiming the reward. The admin dashboard is for you. This is where you can track all affiliate sign-ups and watch as they promote your site. You can then compute their commissions in this section and pay them with a single click. After that, you need an affiliate dashboard. This is where your referrers can check if they are performing well. It also includes their unique tracking ID that they can use to promote your website. Designing your pages with a referral software is easy. In fact, you can generate them with a click of a button. Don’t forget to test your pages. The last thing you want to happen is to promote a program that can hardly receive referrals. 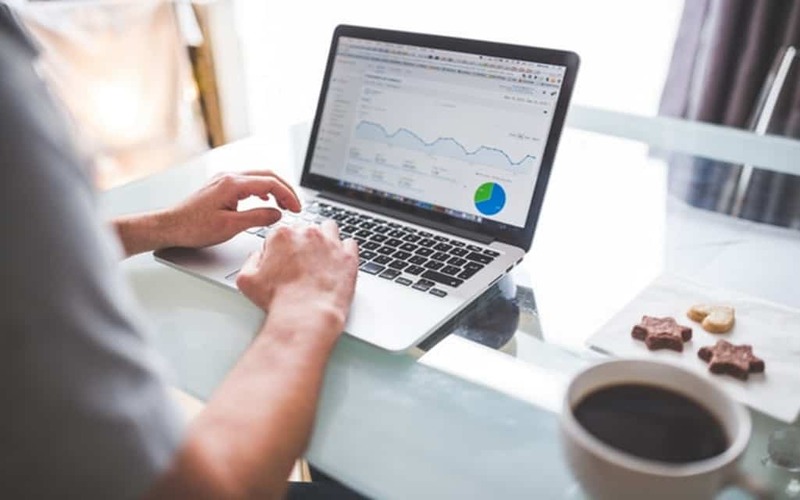 That will not only dilute the effectiveness of your program, it can also disappoint the referrers who have worked so hard on promoting your site. So test your pages lest you want to face an army of angry referrers. Once everything is set up, all that’s left is to promote it. For that, I have 5 strategies that you can use to instantly drive more people into your referral program. Have you seen that subtle line of text at the top of most ecommerce websites? That’s a homepage notice. It helps you to inform your visitors about the latest products and discounts in your website. Similarly, you can also use it to inform them about the existence of your referral program. You can entice your visitors by stating the reward right away. There are times when you might need to remind your customers that you have a referral program. You do this through a pop-up. You can have this either in your product pages or in your checkout page. It can pop up showing the discount code or the reward and how they can get that even before they proceed with their purchase. If you have been running an ecommerce website for quite some time, you’ll most likely have a list of customers with you. Now, you can use this to promote your referral program. Simply email them that they can get a discount, cash or freebie and they will be excited to open your email. Have a social media profile? Use that to promote your referral program. This can be as simple as posting about your program or creating a cover for your Facebook page or other social media accounts stating that the program is open for referrals. This may be simple but it can drive more people into your referral program.